Could Comes With Music be a mobile music masterstroke? 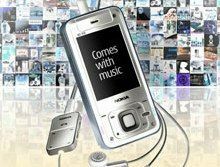 Nokia has announced a deal with Warner Music Group to use its back-catalogue for the forthcoming 'Comes With Music', extending the appeal of the soon-to-be released service. Nokia is apparently gambling big time on the free music download service, which will be available to a number of new handset users later this year. Although reports the Finnish company is paying Universal Music alone $35 per handset to carry the service, the more companies it can sign up, the more appealing buying a CWM handset will be. EMI is the last label of the big four to get involved, but the chat on the underground is the company is interested and it's a matter of when and not if all the top labels will be on board before launch. Warner's music catalogue will also be made available on the Nokia Music Store, allowing some good old download fun to be had to your PC. Woohoo. "Nokia's CWM service will be a significant step forward in the evolution of digital music. It's the first global initiative to fundamentally align the interests of music companies with telecommunications companies," said Edgar Bronfman, Jr., Warner Music Group's Chairman and CEO. "Through this innovative service and business model, all parties are equally driven to create the best and most comprehensive music offering designed to meet the ever-expanding consumer appetite for music and music-enabled devices." Digital downloads MUST be the future if the music labels are getting on board.